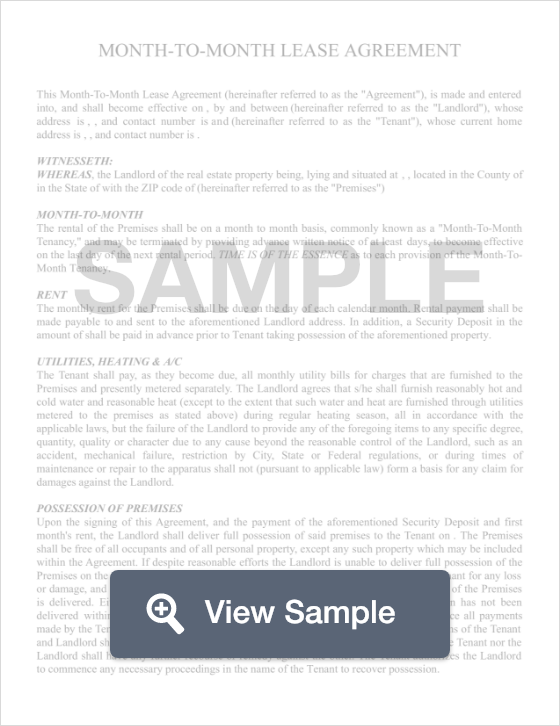 What is a New York Month to Month Lease Agreement? New York Month to Month Lease Agreement: What Is It? In the state of New York, a month to month lease agreement is a short-term tenancy agreement that officiates a lease where the tenant and landlord are only obligated to remain in the contract for one month. However, one interesting amenity of a month to month agreement is its flexibility. Rather than the tenant moving out after one month, the month to month agreement will renew at the beginning each month indefinitely until either the tenant or the landlord cancels it. Otherwise, month to month lease agreements are exactly like their long-term counterparts, specifying important information such as rent amount, due date, rules of occupancy and other information such as parking provisions and so forth. When a tenant or landlord wishes to terminate a lease, a termination letter must be written and submitted to the other party no later than 30 days before the effective date. In the state of New York, for all property, real estate, and buildings outside New York City, a landlord or tenant who wishes to terminate a month to month lease must do so via written termination letter at least 30 days before the termination will become effective.